“We’re all business this year,” Cedar Stars Academy captain and assistant coach Christopher Katona said in an interview with Front Row Soccer reporter Michael Lewis last week. Katona wasn’t kidding. The Stars rolled past a strong Shamrocks side 5-0 on Sunday morning in their home-opener at Ramapo College Athletic Center. 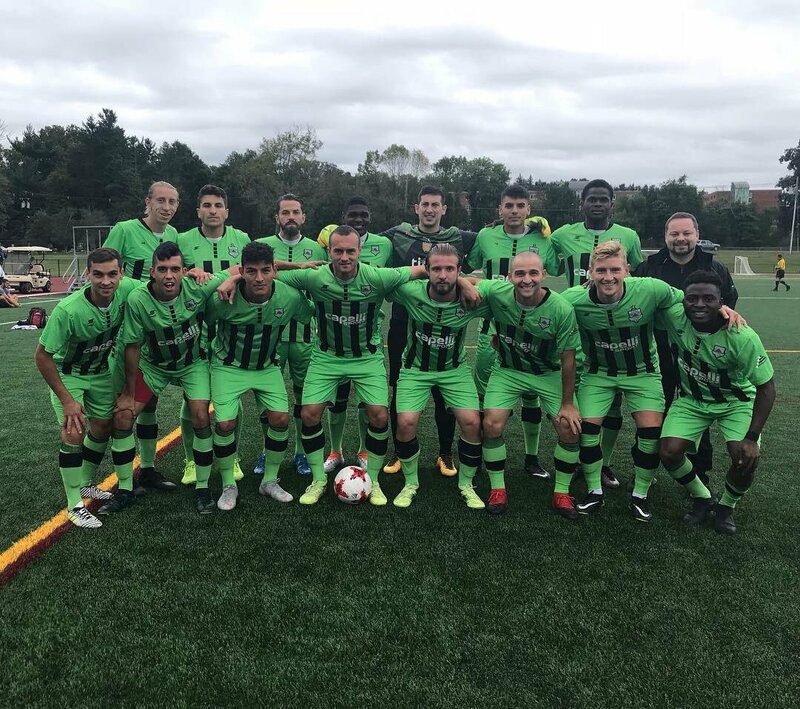 Shamrocks entered the match on a 2-0-0 record, which includes a 3-1 victory over reigning champions Lansdowne Yonkers F.C. Hence it is quite a scary win from the professional amateur players, but not unlike them. This match was Region I Coach of the Year Austin Friel’s first game in charge of the club. It was an encounter to remember for ex-MLS midfielder Dilly Duka as well as he netted his first CSL goal in his third appearance. Daniel Cordeiro sent Duka on goal. Katona netted a brace to strengthen his lead at the summit of the top scorer chart with six goals in two CSL matches. The forward scored via Duka and Walter Calderon’s passes. New York Cosmos forward Bledi Bardic was on target also as he turned Martin Dadaj’s pass into a goal. Bardic is now the third top scorer with three goals. CSA’s 23-year-old prodigy Calderon recorded his first CSL goal of the season from Katona’s first assist of the season. With this win, the Stars jump to a 5-0-0 record in all competitions while scoring 20 goals and conceding three. Home sweet home for the energetic Paul Grafas and his men. After starting the season with two rough away losses, Doxa S.C. won for the first time this season in their home-opener as they got the best out of Central Park Rangers Whites 3-2 on Sunday night at Joseph F. Fosina Field. Doxa’s summer signing Joseph ‘Joey’ Sanchez ushered the club to the victory with his first CSL goal: an 88th minute winner. Rewinding back from the 2016 Northeast-10 Conference top player’s winning goal, his teammate Kosta Pappa hit the post in the 30th minute before Kareem Joachim scored the opener in the first half to go on a three-game scoring streak. Central Park Rangers leveled the scoring before halftime when James Greco converted from the spot after Artur Muginov was fouled in the box. CPR went down to 10-men as ex-City College of New York captain Matt Mbamelu was hit with a second yellow. Despite playing down a man, the Rangers went ahead of Doxa in the 75th minute when Muginov scored amid a scramble in the box. The home side tied the game in the 82nd minute, thanks to Joachim’s penalty kick. It was the Trinidad and Tobago native’s second goal of the game and fifth of the season. Joachim is now the second top scorer of the league. Just six minutes later Sanchez netted the winner. It’s been a climb up the ladder so far this season for NY Athletic Club, they went from a loss, to a tie, to a win in their first three matches. NYAC’s first victory of the season was versus Zum Schneider F.C. 03 via a thrilling 3-2 scoreline in their away-opener at Randall’s Island Field 75 on Sunday night. NY Athletic was the first club on the scoresheet as Jake Mann half-volleyed Francesco Zanetti’s pass to the inner side netting in the ≈35th minute. Zum struck their visitors back with their second goal of the season as Saad Afif steered a magnificent free-kick to the upper right corner of the net. ZSFC went from conceding the first goal to taking the lead, thanks to Atay Yilmaz’s goal from Lukas Hauer’s pass. NYAC pushed themselves back on level term in the ≈70th minute when Ian Pilarski’s free-kick found its way in the net after the ball bounced in the six-yard box. Jimmy Lannon's men found the net again about 15 minutes later to win the game. Alejandro Sucre beat a Zum player down the line before sending a cross in. Patrick Viray dummied Sucre’s cross, letting the ball roll to Rafik Mekhaldi, who one-timed a shot in the net.